This section will be used to highlight and celebrate the great things we do here at Moanalua! Please inform any PD member of the great things that our students or colleagues have accomplished! 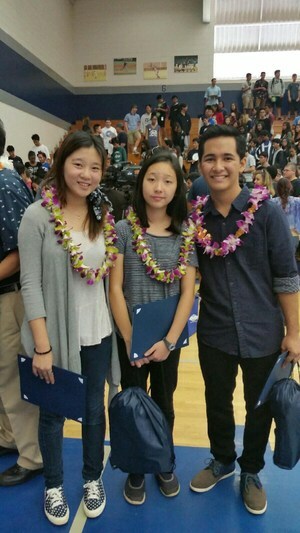 Congratulations to Landon Mauricio, Gina Watanabe, and Jasmine Loo with Team Advisors: Fred Ito and Kelly Calistro for Winning the American Savings Bank Business Plan Competition. They won $25,000 for the school! Congratulations to our Cheerleaders for Winning the State Tournament. Congratulations to Sharon Mendoza - ​Research group has been selected to present their research at the Hawaii International Conference on Education in January! Congratulations to the Band for another great season! Good news! The MOHS Peer Education Program was awarded "Program of the Year" @ the National Student Safety Program Conference in North Carolina this summer! MOHS was represented by a colorful group of students: Daniel Johannes, Lawrence "Fluffy" Thomas, Katie Clark, Tynisa Carter & Jovelyn Catbagan, who did an impressive job leading a workshop and display booth @ the NSSP & ADTSEA Conference. The students also designed a traffic safety t-shirt that took 1st place in the T-Shirt Competition. Moanalua High School 9th Grade Science Students are Regional Finalist 2 Years in a Row - Competed in National STEM Competition in Washington DC this Summer!